NLL training camps will be starting in a month or so. This is the chance for the young players to strut their stuff and get noticed, the veteran players to get back into the swing of things after some time off (a month or so if they played in MLS/WLA/MLL, as many as six months if they didn’t), and the oldest players to see if they have just one more year left in their aching bodies. During the camps, one thing you may hear about is the beep test. I had never heard of this until a couple of years ago, when numerous players being interviewed on various lacrosse podcasts kept talking about it. It turns out my sons had both done it a few times during their phys ed classes. If you are as unfamiliar with this as I was, allow me to enlighten you. First off, everybody hates the beep test. Once I explain what it is, you may understand why. We start with two parallel lines, 20m (65½ feet) apart. There is a device set up to emit a beep at regular intervals. You start behind one of the lines. When you hear a beep, you run to the other line. Then you wait behind that line until the next beep, at which point you run back to the first line. This continues until you can’t make it between the lines before the next beep. But wait! It’s not just a test of endurance. The beeps get faster. You start at level 1 and after 7 trips back and forth, you progress to level 2, where the time between beeps is slightly less. For level 2, you do 8 trips rather than 7, then you move to level 3 where the beeps are faster still, and so on. There are 8 trips in levels 2 and 3, then 9 in levels 4 and 5, and it keeps increasing but not consistently (it’s designed to take about a minute per level, so faster levels require more trips). By the time you get to level 12, you have to run back and forth 12 times before you get to the next level. Note that this is continuous. There are no breaks between levels; once the beeps start, you start running and basically keep running until you can’t anymore. According to Wikipedia, the beeps are 8.47 seconds apart in level 1, 8 seconds in level 2, and they keep getting faster. By the time you get to the nigh-impossible level 21, the beeps are less than four seconds apart – and when running level 21, you’ve already run almost five kilometres in about 21 minutes. Your score on the beep test consists of two numbers – the level and number of trips within that level that you successfully completed, so 7-4 means you finished four trips of level seven before collapsing / throwing up / passing out. In grade eight, my son Ryan (age 13 at the time) reached about 8-6, and was very proud of that accomplishment. There were a couple of people in his class who got higher, but not much. Unsurprisingly, pro athletes tend to reach higher levels. Or do they? I got almost no responses to a few queries on twitter (both broadcast and a couple of DMs) for NLL players to tell me their best scores. Special thanks to Vancouver’s Travis Cornwall, who was the only player brave enough to respond (yes, that’s a challenge to all other NLL players). Cornwall reached the middle of level 11 last year, while his Stealth teammate Brendan Fowler got to level 13. Travis also reported that Tye Belanger, a former long-distance runner, was a previous Stealth winner and Curtis Manning was the team leader when Cornwall was with the Roughnecks. Cornwall also told me a story (or as he referred to it, a “legend”) about Jim Veltman, presumably with the Rock or Bandits. After running the test for a while, “they stopped it before he was done because they were tired of watching him run alone”. The beep test seems to be popular among coaches, and it’s a reasonable test of both speed and endurance. But it’s not really useful for lacrosse players – at least box lacrosse players. By that I mean you can be a very good lacrosse player and still have a lousy score on the beep test. This is because the test isn’t really testing things that lacrosse players do. Once the test starts, you are running pretty much continuously. Each level you run takes about a minute, so if you finish level 8, you’ve been running for about 8½ minutes. Completing level 12 means 12½ minutes. Running continuously for that length of time never happens in a box lacrosse game. 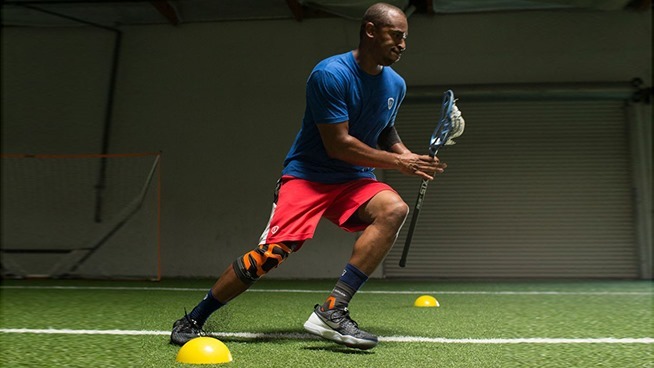 To me, it would seem more useful for field lacrosse or soccer players. Cornwall agrees: “the 300 yard shuttle is a much better lacrosse test. It’s like a minute of running then a minute rest and then again and again. Much more similar to actual game play”. As a coach, you want to keep the 1s and 3s and dump the 2s. Unless they get to level 13.